In 2011, Gerald Thomas was invited to an Indigenous community in a remote area of British Columbia. Working for the Centre for Addictions Research of B.C., he was one of a small team of scientists who observed 12 people take ayahuasca, an Amazonian mixture that induces vivid visual and auditory hallucinations as well as deep emotional and intellectual reflection. The group remained in a longhouse and its surrounding forest for four days. They slept on its dirt floor and bathed in the nearby river. It wasn’t your typical experiment, Thomas conceded. At the same time, he explained how the team observed rigorous protocols for research involving human subjects. Most of the 12 patients were victims of severe childhood trauma who struggled with addictions to a variety of drugs: alcohol, cocaine, and opioids such as heroin. Participants struggled with terrible memories and many years of drug abuse. In the longhouse, they delved into those issues. A shaman—an ayahuasquero—who had travelled to B.C. from Peru worked alongside a “retreat team” that ran group-therapy sessions and meditation. 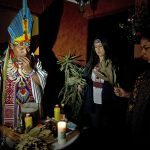 An upcoming documentary called The Path of the Shaman explores how the powerful hallucinogen called ayahuasca can be used to help people solve problems with addiction, depression, and other challenges such as eating disorders. A 2013 paper Thomas coauthored for the academic journal Current Drug Abuse Reviews describes the results: “Self-reported alcohol, tobacco and cocaine use declined, although cannabis and opiate use did not; reported reductions in problematic cocaine use were statistically significant. Five years later, very little further research has occurred. Rigorous studies of psychedelic plants and chemicals are rare. It wasn’t always that way. Decades ago, scientists across North America eagerly investigated the clinical benefits of psychedelic and otherwise psychoactive substances. They were fascinated with mescaline, found in the peyote cactus; psilocybin from so-called magic mushrooms; and lysergic acid diethylamide, better known by its acronym, LSD. And they were making progress. Then, in 1970, the U.S. government classified all three as Schedule I narcotics, grouping them in with hard drugs like cocaine and heroin. Officially, they had “no currently accepted medical use in treatment”. Investigations into how psychedelic drugs might help people with disorders such as depression and alcoholism halted. Almost half a century later, a psychedelic renaissance of sorts is under way. Reputable scientists working for prestigious institutions are increasingly paying attention to these drugs. Kenneth Tupper is a director at the B.C. Centre on Substance Use (BCCSU). He previously worked in drug policy and harm reduction for the B.C. Ministry of Health, but his passion is psychedelics. Their “educational and cognitive value” was the subject of his master’s thesis, and his PhD dissertation for UBC is a 348-page paper on ayahuasca and public policy. Tupper also worked on the ayahuasca review of which Thomas was the lead author. Now he’s part of a team the BCCSU has assembled to put Vancouver at the forefront of this renaissance. 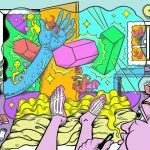 One reason this is exciting, Tupper continued, is that many of the areas where psychedelics look most promising are ones where pharmaceutical medicines long ago hit a wall, areas like posttraumatic stress disorder (PTSD), depression and anxiety, eating disorders, and dependence on drugs and alcohol. The question of addiction is an especially urgent one. In 2017, more than 1,400 people in B.C. died of an illicit-drug overdose. In the United States, that number exceeded 64,000 in 2016. An overdose is now the leading cause of death for Americans under the age of 50. The majority of cases lead back to a dependence on opioids: OxyCon­tin, heroin, or fentanyl. The story of how research concerning psychedelic drugs fell out of favour in North America and then only recently regained some legitimacy is a long and strange tale. Parts of it are well-known. In 1943, a Swiss chemist named Albert Hofmann inadvertently ingested LSD and discovered that it stimulated hallucinations. In the 1960s, an American psychologist named Timothy Leary spread word of its therapeutic and recreational potentials with the zeal of a preacher. Rock ’n’ roll legends like John Lennon and Jimi Hendrix led youths to embrace the drug. Another musician, Charles Manson, caused the general public to fear it. According to Erika Dyck, Canada Research Chair in the history of medicine at the University of Saskatchewan, Canada played an underappreciated role in this story. In a telephone interview, she began her story in 1951, when an English psychiatrist named Humphry Osmond responded to a want ad for a job at Weyburn Mental Hospital in Saskatchewan. Upon moving to Canada, Osmond connected with Aldous Huxley, a British author then living in America who two decades earlier had gained considerable fame with the publication of a dystopian novel called Brave New World. Huxley introduced Osmond to mescaline and other psychedelic drugs, and the two forged a close friendship. An English psychiatrist named Humphry Osmond was working at Weyburn Mental Hospital in Saskatchewan when he coined the term “psychedelic” in a letter sent to Aldous Huxley, a British author then living in America. In 1956, they searched for a name for this category of substances that had so captured their imaginations. In letters, Osmond and Huxley traded words and debated their meanings and Latin roots. “To make this trivial world sublime, take half a gramme of phanerothyme,” Huxley wrote in April that year. Meanwhile, Dyck continued, closer to Vancouver, a facility in New Westminster called Hollywood Hospital began using LSD and mescaline in the treatment of alcoholism. Dyck, who’s been working with Hollywood Hospital’s patient files, described how at 525 West 6th Street, Dr. J. Ross MacLean treated patients with psychological exams, counselling, and between 50 and 250 micrograms of LSD. From 1957 to 1975, Hollywood Hospital in New Westminster attracted musicians, movie stars, and other celebrities who wanted to experiment with psychedelic drugs in a safe and clinical environment. Hollywood Hospital’s results were promising. “Publications from there and other collaborating units suggested between 50- and 90-percent recovery rates,” Dyck said. But by the late 1960s, psychedelic drugs and researchers paying them attention were becoming badly stigmatized. Across the country, at the Allan Memorial Institute at McGill University in Montreal, another group of researchers was working with LSD using very different methods. Under the leadership of Ewen Cameron, and with financial support from the CIA, patients were administered LSD without their knowledge and often under conditions of sensory deprivation or repetitive stimulation. The program, which the CIA code-named MKULTRA Subproject 68, became public in a high-profile lawsuit and badly tarnished psychedelics research across North America. Psychedelic drugs had also become associated with counterculture movements that were upsetting the status quo. Then, in August 1969, LSD and psilocybin were on display at the Woodstock festival, where they appeared to lead to dancing. The same month, Manson gave LSD to members of his cult following and they carried out a string of murders in and around Los Angeles. The nation was captivated and horrified. Less than one year later, the U.S. government made most psychedelics Schedule I narcotics. In Canada, they were placed under the Narcotic Control Act. Sanctioned medical experimentation effectively came to an end. For almost half a century, the field lay dormant. Then, slowly, through the 1990s and early 2000s, academics’ interest perked and papers began to trickle forth. A full-blown “re-emergence of a paradigm”, as one paper describes it, is now under way. Other projects have sought to explain the clinical effects that those sorts of studies associate with psychedelic drugs. A 2016 paper in the Proceedings of the National Academy of Sciences, for example, described how neuroimaging tools revealed how the brain and nervous system responded to LSD and how those changes appeared to correlate with states of well-being that patients reported after taking the drug. In 2016 researchers in the U.K. used neuroimaging tools to monitor how the brain responds to the presence of lysergic acid diethylamide, the drug commonly known as LSD. Dozens more papers have appeared in equally reputable journals during the past decade. The studies are generally characteristic of a field of research still in its infancy: their sample sizes are small; they sometimes lack control groups; and experiments are often not “double-blind” or “blind” (an experimental-standard procedure that hides information in order to prevent bias but is difficult to apply to psychedelic drugs because their effects are so obvious). But now a second period of research is under way wherein academics are expanding sample sizes and building on that earlier work. And scientists in Vancouver have positioned themselves at the front of the field. The B.C. Centre on Substance Use was established in April 2017 under the leadership of Dr. Evan Wood. At a café across the street from St. Paul’s Hospital, Wood described the team he’s brought together. Wood acknowledged there is a lingering stigma around psychedelic drugs. He noted that funding remains a challenge. (“I’m at the ready to help philanthropists and possible donors understand the nature of the work and why we believe this is a critically important research area,” he added.) But Wood said they’re taking a “science-driven and evidence-based” approach, the same as the BCCSU would for any field of research. In a separate interview, Tupper revealed the team’s first project: a clinical trial that will begin later this year to examine the effectiveness and safety of MDMA-assisted treatment for PTSD. That is, they’re going to study ecstasy, or molly (though street drugs sold under those names are usually cut with other substances unknown to the buyer, whereas the BCCSU’s MDMA will be pure). The BCCSU will serve as one of 16 locations across Canada, the United States, and Israel where teams will work on the same experiment under the guidance of the Multidisciplinary Association for Psychedelic Studies’ (MAPS) MDMA-Assisted Psychotherapy project. It’s a so-called Phase 3 clinical trial, which is normally the last phase of review a drug receives before it is approved for public use. Only 25 to 30 percent of drugs that enter Phase 3 pass successfully. But MAPS’s Phase 2 review was promising. Concluded in 2016, it found that one year after participants diagnosed with PTSD were given MDMA, 68 percent no longer experienced symptoms. Phase 2 results were based on 107 participants. The goal for Phase 3 is for more than 200 patients to complete the study, approximately 18 of whom will do so at the BCCSU. The Multidisciplinary Association for Psychedelic Studies’ MDMA-Assisted Psychotherapy project sees the drug administered in a therapeutic setting to help patients who suffer from post-traumatic stress disorder. Similar to the ayahuasca ceremony that Tupper reviewed in 2011 and the earlier experiments with LSD at Hollywood Hospital, he explained, the MAPS Phase 3 review of MDMA will see it administered in highly controlled settings where two therapists are present and engage each participant to establish a strong therapeutic relationship. Actual work with patients likely won’t begin until mid-2018, but Tupper said the BCCSU is already preparing for its second foray into psychedelics: psilocybin for the treatment of substance-use disorders. Another open question is exactly how psychedelic drugs like MDMA and psilocybin work to help correct the problems that researchers suspect they do. That’s in part because we don’t fully comprehend the problems themselves. Modern science can usually explain how a medicine works to heal a physical ailment. For example, antibiotics resolve a bacterial infection by killing those microorganisms or inhibiting their growth. But ailments like PTSD and addiction are problems of the brain—disorders that we generally know much less about. Before joining the BCCSU, Mark Haden established a MAPS presence in Canada and served as its board chair for the Vancouver portion of the MAPS Phase 2 review of MDMA. That study, which was led by Dr. Ingrid Pacey and Richard Yensen, marked the first time a psychedelic drug received a proper clinical review in Canada in more than 40 years. In a telephone interview, Haden explained what we know and don’t know about how MDMA could assist people with PTSD. “It’s a very complex question,” he began. “For MDMA, let’s go back a notch: what is PTSD? PTSD is an unconscious tape loop that repeats itself and is associated with emotional distress. Taken in a therapeutic setting, he continued, MDMA can help address those symptoms. The B.C. Centre on Substance Use has assembled a team that aims to put Vancouver at the forefront of research related to the potential benefits of psychedelics drugs like MDMA and psilocybin. He suggested that, more broadly, it’s about addressing the root of a problem. With psilocybin and addiction, he hopes the same principle will be found to apply.